The Chromosome Painting feature is an in-depth way of looking at your Ancestry Composition results. It shows a colorful representation of the 23 sets of chromosomes that make up your genome. The chromosomes are shown in pairs and labeled with numbers (1 through 22) or the letters X; females will see two copies of the X chromosome, while men only see one copy of the X chromosome and a gray diagram of the Y chromosome. This is because women inherit an X chromosome from each parent while men only inherit an X chromosome from their mothers. Instead of a second copy of the X chromosome, men inherit a Y chromosome from their fathers. The Y chromosome follows a special pattern of inheritance and isn’t used to generate your Ancestry Composition report, so it is shown in gray. Gray regions in chromosomes 13, 14, 15, 21, and 22 represent parts of the genome where the DNA sequences in those regions are highly repetitive, hard to measure, and don't contain as much interpretable information. 23andMe doesn’t test any markers in these regions, which are called "acrosomes." Go to your Ancestry Composition report (opens in a new tab). In Chromosome Painting, your genome is “painted” with colors representing up to 45 different ancestries. You can hover over or click on the different ancestries in your Chromosome Painting to learn where they’re found in your genome. The colors in your Chromosome Painting tell you about your Ancestry Composition, but you can learn even more by looking at the number and length of the DNA segments assigned to each ancestry. This is the information that your Ancestry Timeline is based on. If you are male, you inherited all of the ancestry painted on your X chromosome from your mother. Because men and women inherit this chromosome differently, only certain ancestors could have contributed to your X chromosome. Note: To read the pedigree chart below, start with the blue square at the bottom of the chart (which represents you), and work your way through each generation to the top of the chart. Each ancestor is represented by either a circle or a square; female ancestors are represented by circles, and male ancestors are represented by squares. Ancestors that could have contributed to the X chromosome are highlighted in blue. If you have the same ancestry painted in the same place on both copies of a chromosome, then you inherited the same ancestry from both of your parents in that region of your genome. Below you can see an example of someone who inherited British & Irish ancestry (dark blue) on both copies of chromosome 15. If your parents come from different genetic backgrounds, then you may be able to guess which chromosomes you inherited from which of your parents just by looking at the ancestries painted on each chromosome. Below you can see an example of someone with two parents from different genetic backgrounds. For technical reasons, this will work even better if you are connected with a parent* because our computational algorithm will be able to phase your raw data with more accuracy. 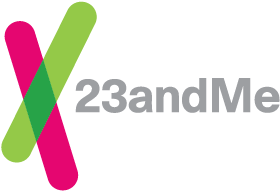 *If you have a biological parent, who is also a 23andMe user, you can connect with them to improve the resolution of your Ancestry Composition results. If you’d like to explore at an even more advanced level, click on “Change confidence level” and move the slider that appears above your Chromosome Painting. You can explore the different views of your Chromosome Painting at different confidence levels, and you can also compare those different views to each other. The algorithm we use to calculate your Ancestry Composition analyzes one small piece of your DNA at a time. For each piece of your DNA, we calculate the probability of that piece coming from each of 45 different populations. The confidence slider on the Chromosome Painting allows you to explore our estimates of your genetic ancestry at different probability cutoffs. For example, if a segment of your DNA has a 55 percent chance of being Japanese, then that segment will be painted as Japanese at the 50 percent confidence level, but it will be painted with a more broad ancestry (one of Broadly Japanese & Korean, Broadly East Asian & Native American, or Unassigned) at the 60 to 90 percent confidence levels. For a detailed technical explanation of how we calculate your ancestry and paint your chromosomes, check out the Ancestry Composition Guide. Do the chromosome numbers (1 through 22) mean anything? In Chromosome Painting, your chromosomes are shown in pairs and are approximately ordered by the length of the chromosome—chromosome 1 is the longest and chromosome 22 is the shortest. You received DNA on these chromosomes from recent ancestors on all branches of your family. Because the DNA on these chromosomes is randomly shuffled each generation, it is the length and the number of segments from a particular ancestry, not the specific chromosome number (e.g. chromosome 1), that is informative about your ancestry. We recommend visiting Ancestry Timeline to learn how many generations ago you may have had a single ancestor who descended from a single population. Monday through Friday, 6:00am to 8:00pm PST/PDT. Saturday and Sunday, 8:00am to 4:00pm PST/PDT.